Tell us a little bit about your piece for Thinkspace’s ‘5 Year Anniversary Show’ this November? 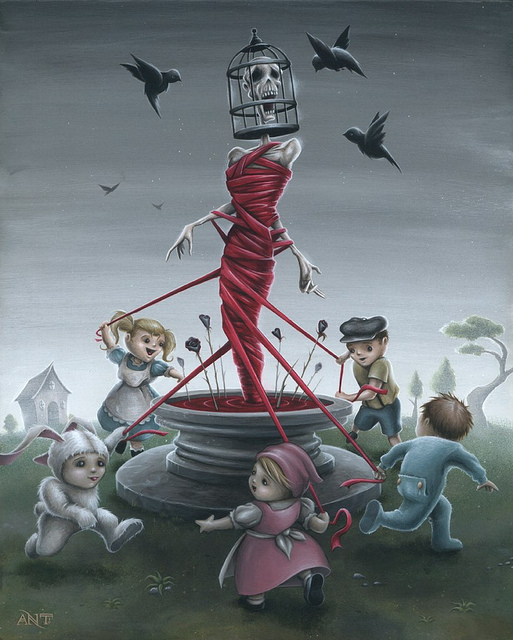 “Ring Around the Rosy” is a sort of self-portrait of my state of mind based on the maypole game. I’ve been recently doing so many painting with kids in them, and as much as people seem to like ‘em, I’ve started to feel like they’ve become too prevalent and cause me not to push my concepts and imagery. So as I move away from painting kids this piece is a way to kind of explain what I’ve started to feel like they are doing to me creatively. What were you doing back in 2005 when Thinkspace started? I was working on my first two paintings to put into the first Thinkspace show/my first show! So this five year anniversary show for Thinkspace is also my personal five year anniversary of doing gallery showings. Name 5 things you can’t live without in your studio? Other than the basics like paints, brushes, chair, etc… I’d say my computer, music, movies, art books and a beverage of some sort. Just keepin’ on keepin’ on. I hope to have bigger shows, bigger paintings and to be pushing my skills and ideas further. I’ll have the project room at Thinkspace in February for my ‘A Time to Forget’ show which I’m super excited about. I’m really trying to push both my quality of work and my concepts. Look for Anthony’s upcoming solo show this February at Thinkspace… more details announced soon!